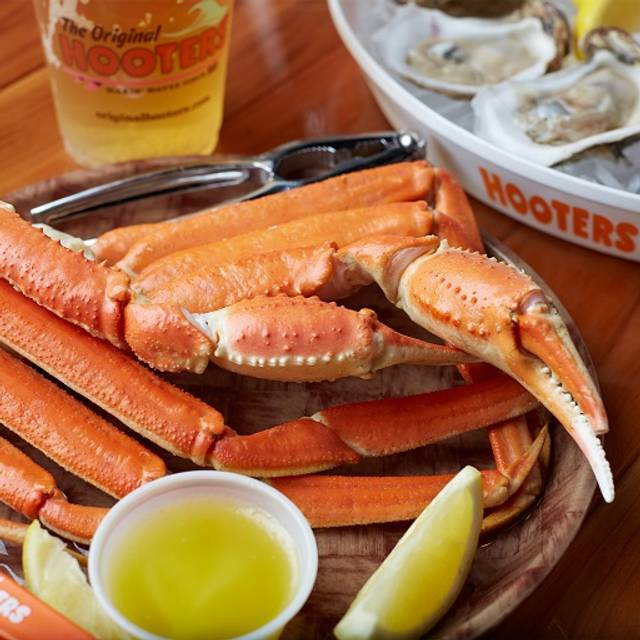 You must make reservations at least 5 minutes in advance of the time at Hooters Clearwater. 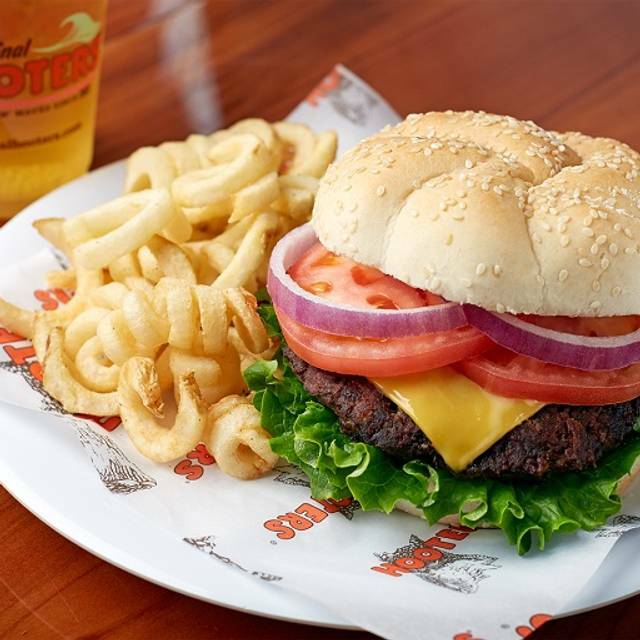 Hooters is the place to be for great seafood, signature burgers and sandwiches, specialty salads, ice cold beer, a full liquor bar and of course, our world famous chicken wings served up in one of our signature sauces. With a casual, upbeat atmosphere, a video wall and plenty of HD TV’s, you’ll have a front row seat to all the games. Hooters, the original wing joint. Served with drawn butter, steamed hot and EZ to peel. Field tested in rural Iowa - so you know they're good! Don't let them get away! Served with drawn butter. 1 lb. Who dare tackles a turkey burger smothered in marinara and melted provolone? Lettuce, tomato, onion, cucumber, cheese, croutons. Hooters features a full liquor bar stocked with a variety of craft beers, signature cocktails, wine, and sangria. Kick back, put your feet up, drink up! Great staff. Small problem with chicken wings but the manager on duty and the waitress fixed the issue quickly! Unhappy with service, waitress wasn’t very attentive to our table. I’m assuming it’s due to our table being a table of females. Wings with hooters flavored sauces were very dry. We had to flag down our waitress in order to place our food order, otherwise we would have just been sitting there hoping she would return. We always get great service at Hooters. The staff is friendly and the food is great! 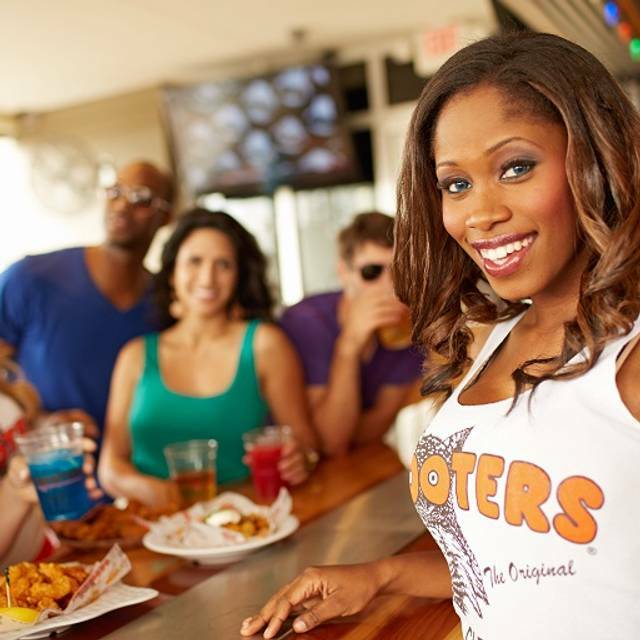 We go to Hooters regularly and continue to recommend the location to friends and family. Love it! Enjoyed a recent visit for beer and chicken wings-what else? Hooters has the best wings of everyone. Must pay extra for fries to go with a burger. Got about 6 curly fries for the cost. Their fish and chips is not what you'd expect. I got about 6 small pieces of fish that were lightly battered and neither deep fried or crisp. Don't know what they did to them . They were cold and soggy. The tater tots, on the other hand, were hot and very good. We had made a reservation here over a month in advance, and confirmed the reservation 24 hours before we were due to dine here. We arrived on time and the lady at the check-in desk did not seem to understand the concept of a reservation. After playing with the computer screen for a while she disappeared into the restaurant for a couple of minutes and when she returned said that they were waiting for a table for us. Meanwhile several other people had arrived, without reservations, looking to eat and were asked to wait in line. After a further 5 minutes waiting we again stressed that we had a confirmed reservation and showed the hostess the booking on my mobile phone, and she then went off into the restaurant again - it is perhaps significant that at no point did she ask our names. While she was gone another hostess appeared and asked the people behind us in the queue for the size of their party: being told 2 (the same as our party) she took them immediately to a table. When the check-in lady re-appeared after another 5 minutes she told us that they were now preparing a table for us - still. At this point we gave up waiting, having patiently stood there for nearly 20 minutes, despite having a confirmed reservation and seeing other people served ahead of us and left. At no point did the arrivals hostess seem to have any idea about what was happening. This meal had been long-planned as the last evening meal of a 2 week Florida holiday. We had eaten many times over the years at Hooters, including this famous branch, and never before experienced such incompetence and rudeness. We suggest to anyone who is planning to dine here to go along with the lowest possible expectations of customer service and be prepared to be disappointed. Oh yes, and we then drove across the Causeway to Tampa and ate at the Bahama Breeze where the food and service were top class. Loved having Camila Cabello as my server..
fun and memorable. Bravo on your choice of personel and their maturity and training! As always a fun place to meet friends watch sports and just hang out. Decent food loved the patio. It was a nice atmosphere. I made a reservation online for 6. Then I called to make it 7. I got info on table . We arrived didn’t seem to know about us. We’re putting us in back then couldn’t cuz table was for 16. Manager got in my face alittle. They don’t have tables for 8. Weird. He was giving us a 6 person table and putting chairs on each end. There would be no leg room or table space. I asked him to push tables together. He was indignant. He Said that would make it a table for 12. I had to insist on that. Geez. When we arrived at this location, we were told that they do not except reservations on the weekend. The server was very rude to all members in the party. When we spoke with the manager, she apologized but did not help the situation. We left and went down the road to The Wing House. Very disappointed! Ordered wings. Delivered cold to touch! At Hooters?? Drinks are watered down. Stick to beer or order shots neat with a side mixer. We go here all the time and love the place. The wings are the best, but there Nachos and bang, bang shrimp app are good to. Yes the beer is cold and the cocktails well made. They have Oysters on the half, crab legs, grouper sandwich too. If you don't know it is family friendly and the young ladies are great. Stop by, you will enjoy yourself and you can watch some sports too. Even with big sporting events on the big screens we were able to be seated right away with our table of 6 we reserved. Food and beverages are always good here. Service can vary from ok to great. We thought they did a good job considering it was packed. As long as the wings keep getting cooked, the beers keep flowin, and sports on the screens we'll keep coming back. We had to wait 15-20 min past our reservation time. The manager wanted to seat us at a high top when we had small children with us. Not a good idea as they could fall. Great to have visited and say we have been to the very first Hooter's where it all began. Food was great but that's where it ended. Service was poor, left stood at table whilst it was cleaned, took away cocktail to refill and brought back a water???? Overall would nit recommend and won't be returning. Service was good. Food was horrible. Food was way to greasy and came out cold. Would not recommend to anyone as I see other reviews having cold food. Definitely was not worth the 60 bucks spent there not even worth 15. Wish I would of been refunded my money! We had a party of 10 for my father, to celebrate his upcoming wedding. Great staff and food. Thanks for the great time. Staff was great. Made a big deal for our birthdays. Food really good. Great service. You don't go to Hooters for the food. But this was the worst Hooters food I've experienced. The Hamburger was supposed to be medium but was raw in the center. The burger was tasteless. The bun was stale, the slaw tasted like fish. Our waitress was prompt, fun and energetic, sweet personality and playful with my wife. The servers were great despite a very busy evening. Wings are always great. Great food as always. Very busy and packed. Ended up waiting past the reservation time. But that was fine. Servers on Fridays seem more busy than other days. This was the first time in a while we went for dinner. It's busy. Think we will stick to lunch in the future. Very dissapointed our foodcameout separately wefinished eatingand we finally got ourfries,. 1st timein a hootersmall 10 years! For a group of 20 there was one waitress and she did the best she could to keep up. We were disappointed that there was only one of her and 20 of us because we were slow to get served and not all at once. In other words, some people were ready for the check by the time other persons in our group began to eat. Seemed to not know that reservations were even an option. Had a table so all is good!